While the two Phd’s who wrote this do have an implicitly sound point: most educational fads stem from sound pedagogical practice misapplied and over-simplified. The authors are long on assertions and short on evidence themselves. For example, while critiquing character education, they talk about universal moral principals as if that were uncontroversial among those who study meta-ethics. They also actually have a virtue ethics theory of holistic values of education that does not even attempt to separate those values out from intelligences or logics, and are stated as natural facts. While they talk about separating “indoctrination” from clear thinking, these assertions are akin to indoctrination as they are unquestioned philosophical positions accepted because of a larger framework or ideology that is taken as natural. This is highly problematic as it claims these virtue traits are essential to learning but does not pedagogically or epistemologically try to prove those assertions. While there some more recent fads are discussed such as “brain-based learning” and discussed well if it an abstract way, but most of the fads discussed were popularized in 1990s from research in the in the late 1960s and early 1970s, so even when this book came out in 2007, these fads were largely not operating assumptions in education. Another frustrating thing is there are few citations of research and most of the citations there are just to work done around the two authors own centre and movement. The basic assumption of this book is sound in main, and many of the specific points are insightful, but the paradigm it argues for is asserted but not given a lot of evidential weight itself and many of the arguments are effectively generalizations and straw-men who function polemically. 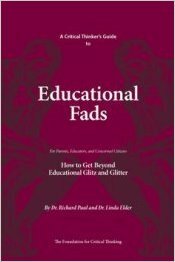 The fact this book is so mixed in its quality is frustrating to me because the premise that fads in education are based on incomplete uses of often valid research or out of date science that has been transformed pre-maturely into fragmented “best practices” is both very important and under-explored. The assumptions about cognition and kinds of knowledge alone dominant in most education schools (learning styles, left-brain and right-brain) has been problemized by both behavioral science and neuroscience and sometimes outright rejected in psychological models for one or two generations but are still basic assumptions in pedagogical training. Perhaps if this book were longer and more interested in establishing its own paradigm and more up-to-date on what contemporary fads are instead of a short polemical pamphlet, it would do justice to its premise. Overall, worth reading but with the same skepticism it asks us to apply to implementation of fads.